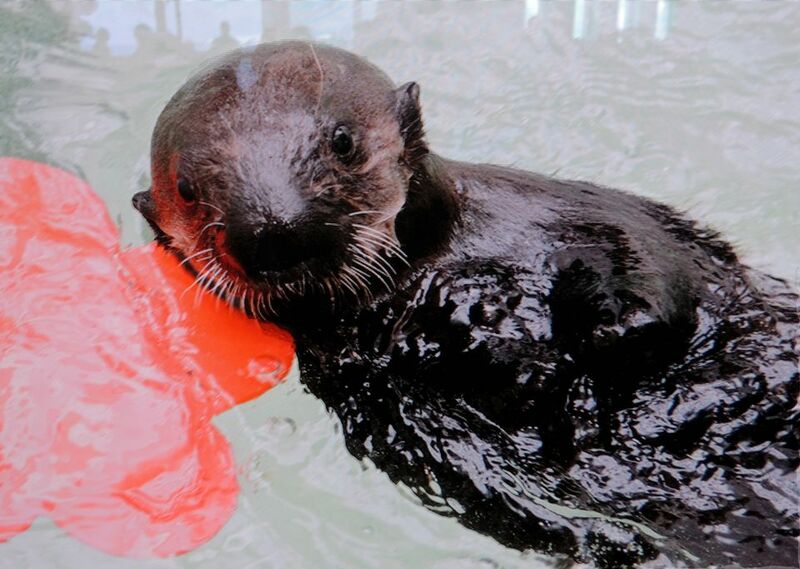 She was only known as “Pup 719” during her rehabilitation, but the Shedd Aquarium at Museum Campus in Chicago announced its female rescued southern sea otter would be called “Ellie.” Over 1,500 votes were cast from Shedd’s members during a month long contest to name the pup. A special event for members and the press was held at Shedd Aquarium to announce the sea otter’s new name. After the announcement, Ellie even came out to welcome the crowd, many of whom were excited children. Chicago’s Shedd Aquarium uses opportunities such as the sea otter naming to give members a chance to connect with the animals. Other names considered for Pup 719 included Cali, Gilly, Poppy, and Reya. Children who had chosen the name Ellie proudly brought the sign in to announce it to everyone. Ellie originally came to Shedd after being rescued from CarmelBeach in California. The rescued pup currently weighs about 15 pounds, but she’s growing quickly. Through the rehabilitation efforts at the aquarium, she has begun sleeping through the night and eating solid foods. It is a wonderful accomplishment for Shedd to have rehabilitated the pup since southern sea otters are a threatened species. Ellie is now settled into her new habitat where you can visit here. You can get the latest updates on her by visiting Shedd’s website at sheddaquarium.org/sheddpup. Her progress will also be posted on the Shedd Aquarium Facebook page and on the Twitter account. The sea otter pup is not the only thing new at the aquarium. Among the other offerings is a special exhibit, “Amphibians features 40 species of caecilians, frogs, newts, salamanders, and sirens. This year the Shedd Aquarium is offering a Spring Break Camp for kids enrolled in grades three through five, and a minimum of eight years of age. Campers will be able to visit behind-the-scenes area, travel to local nature spots, and learn more about the animals cared for at the aquarium. Two sessions of the camp will be offered: March 28-April 1 and April 18-22. Space is limited. You can get more information and register your child online on the Shedd website. Many more fun things are taking place at the aquarium this spring. Spring is also nesting season for penguins at Shedd . In order to get the process started, the staff has introduced sticks and rocks into the penguin habitat to signal the start of nesting. Guests to the aquarium can watch the birds building their nests. Updated Aquatic Show Emphasizes Rehabilitation. The Aquatic Show at Shedd has been expanded to emphasis all of the rescue, animal care, and training done at the aquarium in their conservation initiatives. The new show also allows for a better look behind the scenes of the work Chicago’s Shedd does in and out of this facility. Spring offers many opportunities for Shedd Aquarium visitors to get involved. The “At Home on the Great Lakes” exhibit is a great inspiration to join in Shedd’s Great Lake Action Days and clean up the shorelines in Chicago – right outside the aquarium. Visit their website for more information. By purchasing an advance ticket online to the Shedd Aquarium during spring break you can also get one to come back for a complimentary visit during the Jazzin' at the Shedd days in the summer, saving $40. In addition to all of there is to see at the aquarium, Shedd organizes outside trips, such as the Kayaking in the San Juans excursion coming up June 30-July 4, 2016. For more information on this chance to see orca whales, otters, sea lions, and more in the Pacific northwest, call 312-692-3161, or email cmell@sheddaquarium.org.